Young at heart and part of a fascinating movement to redefine aging and its limitless possibilities, Michelle Stanford is truly a marvel. 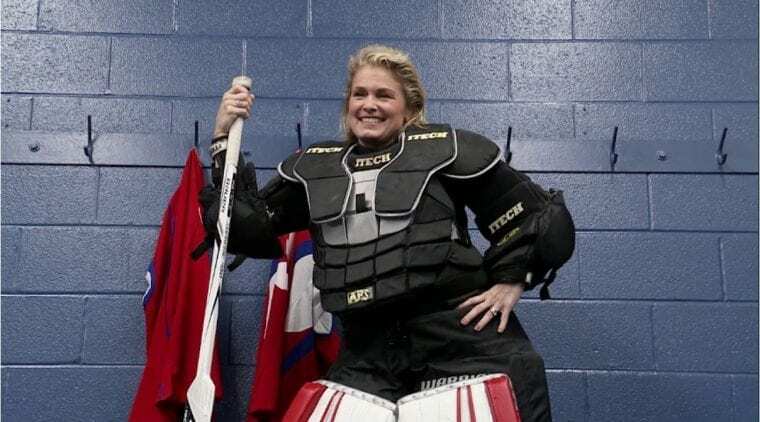 In addition to her love of hockey, standing between the pipes as a participant in the Adult Safe Hockey League (ASHL), Stanford, at 51 years young, is also a corporate executive and an associate priest with the Anglican Church’s Archdiocese of Toronto. Selected as one of Zoomer Magazine’s Ultimate Zoomers for 2018, featured in the final issue of the calendar year, it marked a key highlight not only in Stanford’s athletic endeavours, but a footnote in a memorable year for women’s ice hockey. Among the highlights included the Winter Games in PyeongChang marking the 20th anniversary of the first women’s ice hockey tournament contested at the Games (Nagano 1998), the US National team winning an ESPY Award, while the Minnesota Whitecaps gained admission into the NWHL. Fittingly, there was an element of team spirit that defined Stanford’s experience. Of note, it was her teammates who recognized her enthusiasm for the game and zest for life, nominating her as a candidate for the Ultimate Zoomer campaign, a unique cultural imprimatur focused on individuals from all walks of life who are reinventing aging. Garbed in her goaltending gear, complemented by a warm, reassuring smile, Stanford not only appeared confident, there was an empowering tone to the photographs, revealing a powerful exquisiteness. The description on the magazine page captured that essence perfectly, describing her diverse range of interests, including scuba diving and ambitions to return to Everest base camp. Reflecting on opening the glossy pages of Zoomer for the first time, viewing her visage, there was initially a self-effacing degree of discernment. Yet, that sense of surprise evaporated, replaced by a gratification. Although Stanford proclaims that perhaps a more profound aspect of authenticity would have emanated from being photographed directly after the game’s final buzzer, the final product managed to reveal a gravitas and bravura to this frozen warrior. “To be honest, I was horrified (at first). Wearing a ton of makeup, I looked different. I had never seen myself in a magazine. 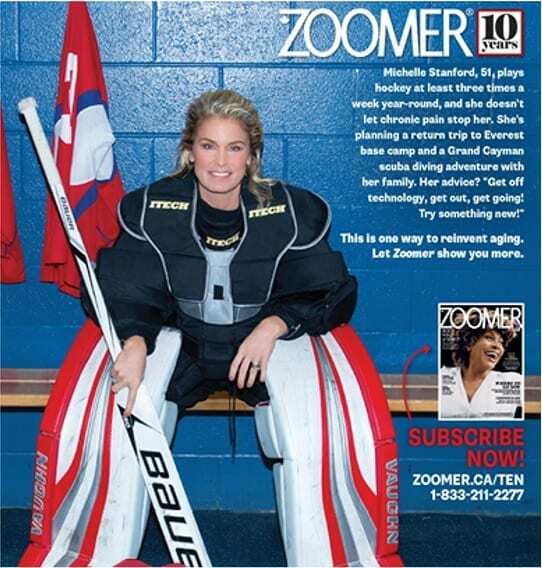 I was proud of myself, I felt I looked pretty tough in my goaltending equipment. Although the end game is a chance to win the Ultimate Zoomer contest, to be announced in April 2019, there is a much greater victory for Stanford. Certainly, the legacy of her appearance in the popular periodical is the fact that it has succeeded in raising a long overdue enlightenment about older women participating in the game. Becoming a popularizer for such a movement, Stanford’s self-assurance and reassuring smile represents a galvanized generation, simultaneously instilling confidence. “I am not sure if I am going to win the Ultimate Zoomer, I would be really honored and grateful. It is fantastic to raise awareness for hockey as an active sport for older people. Although I have limitations, I suffer from chronic pain and there can be quite a lot of pain, it is important to get out there, try something different and stick with it, still come out. In addition to being featured in Zoomer Magazine, there was also another element of exposure for Stanford. Part of the Zoomer brand includes other holdings, such as television channels Vision TV, plus Joy TV (whose broadcast hails from the Pacific Region), AM 740, heard on Toronto’s radio airwaves, along with CARP, the Canadian Association for Retired Persons. Having enjoyed multiple seasons of play in the ASHL, it was part of a compelling reinvention for Stanford. One which also included a sabbatical from corporate life nearly a decade ago, pursuing spiritual calling with studies in a Masters of Divinity. While Stanford is equally adept playing on the blueline, the prospect to explore goaltending was one that resulted in expanding her scope. As one of the realities of recreational hockey involves the occasional scarcity of goaltenders, Stanford’s team was not immune. In the interest of team morale, as a scheduling conundrum resulted in no goaltender available, it proved to be Stanford’s defining moment as an ASHL competitor. Preventing a loss due to insufficient players, capitalizing on an opportunity to allow her team to compete, Stanford simultaneously escaped her comfort zone, while tapping into the familiarity of an athletic background. “This is my sixth season since I started playing with them. I have played with two women’s teams and a co-ed team. Currently, I play four times a week and I also sub on defense. I really like playing on D.
I was interested in being a goalie. In the women’s division, there were not enough goalies, and I wanted to give it a try. One day, our goalie got the times mixed up, and she thought it was an hour later. The transition to goaltender was one that saw Stanford gain an entirely new level of appreciation for the position. Gaining a new comprehension for the combined level of difficulty and physical demand, a challenging practice was both baptism of fire and accomplishment. “Holy cow! At my first practice, I was the only goalie there and I took shots the entire hour. I felt sick to my stomach. The Oakville Hornets women’s hockey association gave me goalie instructions for free. For three or four months, I also played a lot of shinny. Certainly, the environment of the ASHL is one that results in an enduring source of cordiality. Revealing what she enjoys most about being among the league’s participants, the culture of belonging extends beyond the frozen perimeter of the rink, fostering a mélange of friendship and delight. Enriching the competitive experience for Stanford, a spinoff involves the elements of increased self-esteem and teamwork skills, contributing to a healthier individual, encompassing the benefits of sporting activity. “Number one, the people that choose to come. They enjoy the sport. We support each other in the sport, and no one comes to be showboats. Number two, the referees are really supportive. They tell you when you are offside. They make sure the people stay safe. Although the empowering appearance in Zoomer may have supplied an element of celebrity status, Stanford remains grounded, displaying an admirable quality. Observing the bigger picture, finding an immense value in the profound narrative of aging becoming an uplifting instrument to tackle new challenges and overcome them with a vigorous enthusiasm, depicting an optimistic illustration that can serve as a stirring template for anyone’s pursuits.